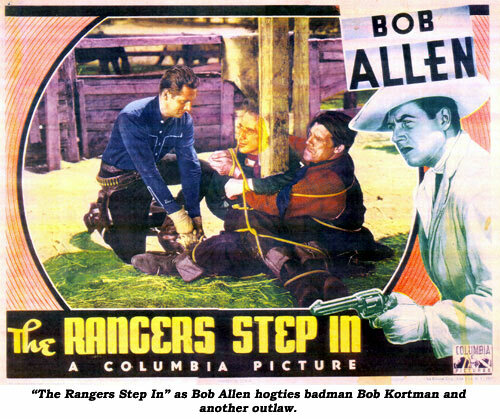 Bob Allen had played second string to Tim McCoy in three B’s in ‘35 and convinced producer Larry Darmour he was star material, so for the ‘36-‘37 season Darmour dropped the difficult Ken Maynard and in rode Ranger Bob on Columbia’s releasing schedule. cowpuncher working for Martha Tibbetts to round up horse rustlers Woods and Bob Kortman who have trained a stallion to steal mares for them. Real hoot to see Wally Wales (now billed as Hal Taliaferro) perform “Frankie’s Flaming Fandango” while the guys dance with one another. Real gay cavaliers! Cute as a button three year old Buzzy Henry steals the show. RANGER COURAGE (‘36 Columbia) When a wagon train of settlers is attacked by white men disguised as Indians, peewee Buzzy Henry rides to Ranger Bob for help. Bob pretends to resign from the service and joins up with rustics Horace Murphy and George Morrell to catch the badmen. 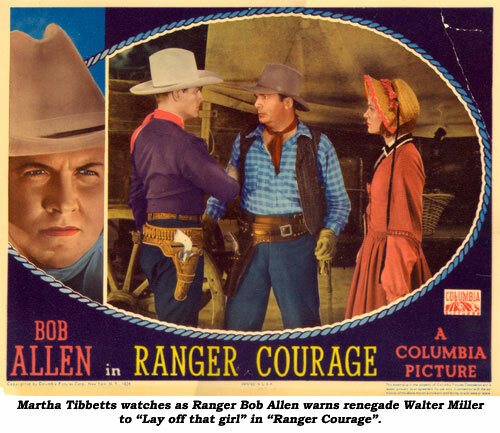 Buffalo Bill Jr. is unbilled as Bob’s Ranger lieutenant. Routine stuff with an ending that makes you feel something was left out. 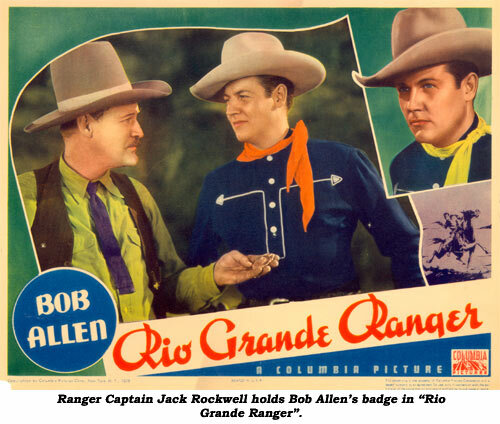 RIO GRANDE RANGER (‘36 Columbia) Outlaws raid banks and ranches in Texas then escape across the line into an outlaw town. 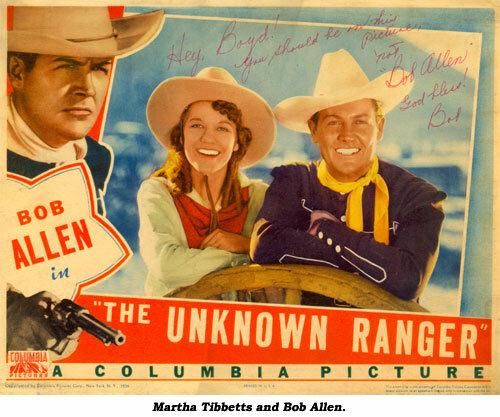 Ranger Bob masquerades as an outlaw and tricks the gang across the state line into the waiting arms of the Rangers. Iris Meredith is always gorgeous to look at—and here she “sings” a duet with Bob. I see why Columbia didn’t ask her to sing again! 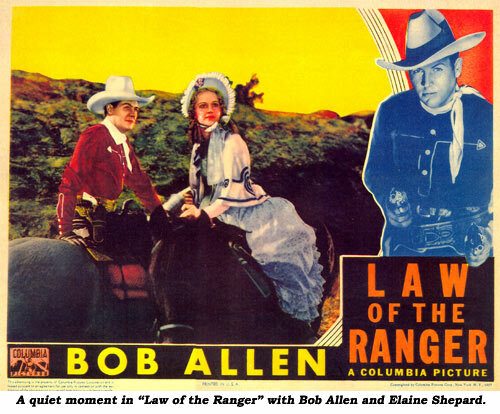 LAW OF THE RANGER (‘37 Columbia) Outlaws are driving homesteaders off their rightful property so they can build a reservoir to control the valley then charge ranchers whatever they please for water rights. State Rangers (led by Buffalo Bill Jr.) send in ranger Bob and pal Hal Taliaferro posing as settlers. Ernie Adams has a nice turn as a newspaper typesetter who likes his liquor and has a big mouth. Routine, predictable story, made to seem even duller by the noticeable lack of any musical score at all—not even in the final roundup. 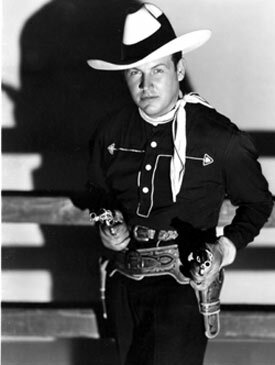 Western Boo Boo: Two-gun ranger Allen has both his six-irons trained on John Merton and his men. Cut briefly to riders, back to Bob who now pulls his right gun from its holster. 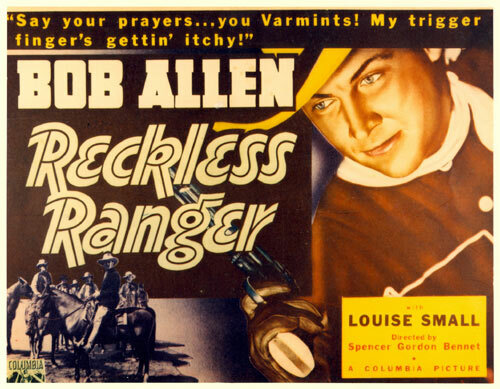 RECKLESS RANGER (‘37 Columbia) Ranger Bob gets involved in a cattleman/sheepman range war after his twin brother is lynched by raiders. Bob and his brother’s friend, Jack Perrin, set everything right. Although some reference works list Jay (Buffalo Bill Jr.) Wilsey as portraying Bob’s ranger pal Jay in this one, it’s not Wilsey. 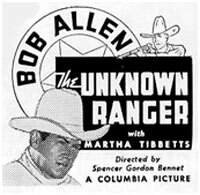 RANGERS STEP IN (‘37 Columbia) Scheming John Merton wants Hal Taliaferro’s ranch because he has advance knowledge the railroad is coming. (Howcum in all westerns, the bad guys always have this first hand know-ledge before the good citizens?) Merton stirs up an old feud between Taliaferro and the Allens knowing there are more Allens in the Valley so they’ll drive out the Taliaferro—then he’ll step in buy up the property cheap and sell it to the railroad for a huge profit. Ranger Bob is caught in the middle as he’s engaged to Eleanor Stewart, Taliaferro’s daughter. Ranger Capt. Buffalo Bill Jr. accepts Bob’s resignation so he can investigate the trouble. In some of Allen’s films, Buffalo Bill Jr.’s role was miniscule, but it’s got some meat to it in this one. Even with good direction from Spencer Gordon Bennet, Allen only had a mild effect on the B-western crowd. After six, producer Darmour replaced him with Jack Luden.